Found 4 file extension associations related to Rayman 2: The Great Escape and 4 file formats developed specifically for use with Rayman 2: The Great Escape. 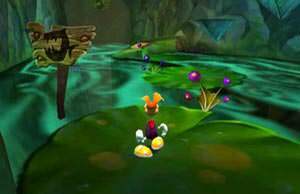 Rayman 2: The Great Escape is a platform video game and the sequel to Rayman. It was developed by Ubisoft and released in 1999. It is considered to have raised standards regarding 3D, level design and game play, being praised by numerous reviews. It was first released for the Nintendo 64, Game Boy Color, PC, Dreamcast, PlayStation and PlayStation 2, and was later ported to the Nintendo DS portable game system as Rayman DS. It is Rayman's first outing in 3D. The game has been mentioned on several "Best Games Of All Time" lists.The only major flaw of the game is Rayman's poorly explained relationship with the new characters. If you need more information please contact the developers of Rayman 2: The Great Escape (Ubisoft Entertainment S.A.), or check out their product website.